Recorded as Habel, Habble, Habelle, Hayball, Heyball, Heball and possibly Hebblewell, this very interesting and rare surname is almost certainly English and locational. However although no such place appears to have beenn recorded in the gazetters of the British Isles for the past three centuries in any of the known surname spellings, from experience we believe that it probably originates from some place such as Hebble or Hebblethwaite. There are two villages of the name recorded in the county of Yorkshire, and also the River Hebble, so the name could have described somebody who lived or worked by or on the river. The meaning of the place and river name is uncertain. Locational surnames are usually 'from' names. That is to say names given to people after they left their original homes to move somewhere else, and were most easily identified by being called after their former homes. Spelling over the centuries being at best indifferent, and local dialects very thick, soon lead to the development of 'sounds like' forms particularly if the nameholders moved a considerable distance. In this case the surname is well recorded in the surviving church registers of the city of London. 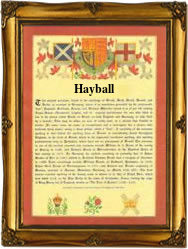 Examples include Edward Habell who married Ellin Scalles at the church of St Lawrence Jewry on November 26th 1615, Peter Heyball, a christening witness at St Katherine's bynthe Tower (of London) on September 29th 1620, and Peter Hayball who married Mary Dench at the famous church of St Mary-le-Bone, on May 18th 1788.